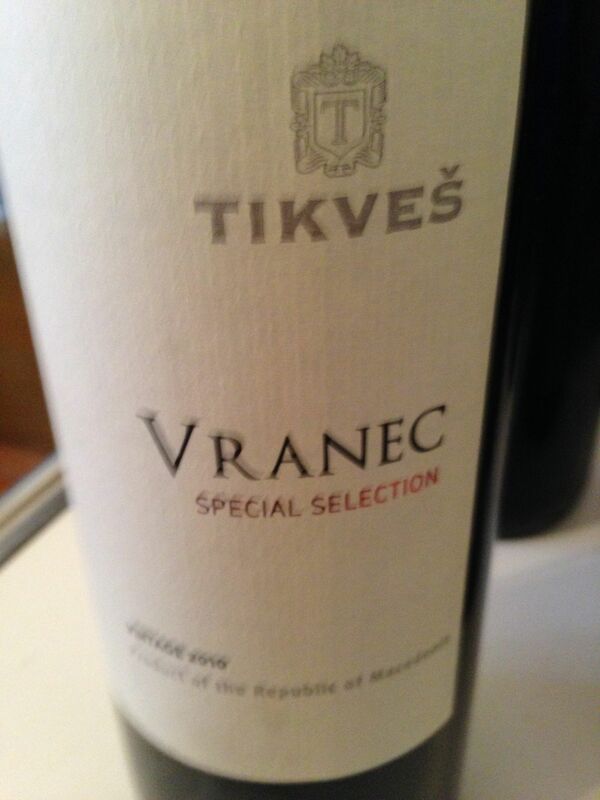 This week’s wine of the week is Tikves Vranec Special Selection from Macedonia. Vranec is apparently the most widely grown grape in Macedonia, a tiny nation in the Balkans, landlocked between Greece, Serbia, Albania, Bulgaria and Kosovo. Apparently I am not the first to discover this wine from Macedonia’s oldest winery. The grape also grows in nearby Montenegro. The grape is a large one and the vine quite vigorous. The grape is also perhaps genetically related to Zinfandel. It certainly has some similarities to that grape in terms of its spicy aromas but it is also somewhat old world in style albeit a bit overdone in terms of the oak treatment. I love finding new funky wines in unexpected places. Certainly while shopping at a local food & wine shop in New Jersey called Jerry’s, listening to Christmas music, this wine jumped out at me. I think it would pair well with a heavily meaty dish. I had it with some lighter fare and I think it didn’t do the wine justice. I’ve had another wine from that same grape and producer in the past but a lower end one, T’ga za Jug , which is the name of a poem by the most famous Macedonian poet, Konstantin Miladinov. Happy New Year! Buon Inizio! a good little wine worth seeking out. also pretty good QPR as I recall. keep up the good work and happy holidays! Nice to see you here at Avvinare. Yes a very good QPR, you are right. Thanks for the lovely comment. Cheers!